The pressures of a rapidly changing world require that we optimize the use of our existing and planned transportation infrastructure. Demand for travel has increased dramatically over the past 20 years, resulting in congestion that steals approximately 6 billion hours of time away from Americans each year.1 Businesses are constantly challenged by the need to move freight quickly on congested roads and rails, which results in increases in the cost of doing business in the United States. Effective transportation solutions are needed to remain competitive in a global economy, address climate change, and meet transportation system user expectations. The public is increasingly calling for greater Government transparency, travel options, and information to make travel decisions. Addressing these needs requires a new way of doing business. This guidebook presents an approach for integrating management and operations (M&O) strategies into the metropolitan transportation planning process that is designed to maximize the performance of the existing and planned transportation system. M&O strategies include a broad range of activities, such as traveler information dissemination, traffic signal coordination, incident management, and transit systems management. By planning for and investing in strategies to manage and operate the existing infrastructure, regions can use what they have more efficiently and improve mobility for the public during both daily operations and emergencies. This approach is recommended as a means to meet Federal transportation planning requirements for promoting "efficient system management and operations" and implementing a congestion management process (CMP), which is required in Transportation Management Areas (TMA). The approach is driven by specific operations objectives for the regional transportation system and performance measures for achieving those objectives. These operations objectives and performance measures are developed for and contained in the metropolitan transportation plan (MTP). Operations objectives provide specific, measurable, agreed-upon statements of system performance that can be tracked on the regional level and will inform investment decisions. The objectives may relate to issues such as recurring and non-recurring congestion, access to traveler information, emergency response, incident management, and transit operations, among others. A plan developed using an objectives-driven, performance-based approach for operations provides a direct connection between operations objectives and project selection. The CMP, guided by specific objectives and integrated into the planning process, is an example of this systematic approach. In some regions, the objectives-driven, performance-based approach for integrating operations into the plan may be performed within the CMP. Establish one or more goals within the MTP that focus on the efficient management and operation of the transportation system. Develop regional operations objectives for the MTP – specific, measurable statements of performance – that will lead to accomplishing the goal or goals. Use a systematic process to develop performance measures, analyze transportation performance issues, and recommend M&O strategies. 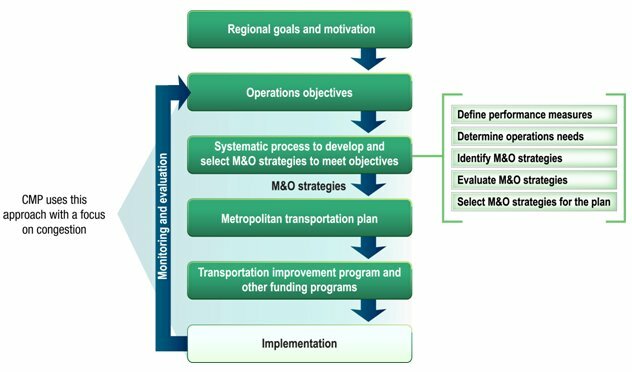 Select M&O strategies within fiscal constraints to meet operations objectives for inclusion in the metropolitan transportation plan (MTP) and transportation improvement program (TIP). Implement M&O strategies including program investments, collaborative activities, and projects. Monitor and evaluate the effectiveness of implemented strategies and track progress toward meeting regional operations objectives. This approach is iterative, with monitoring and evaluation used to refine and adjust operations objectives over time. Coordination and collaboration between planners and operators is a critical component of the approach, which supports the development of agreed-upon regional operations objectives, identification of strategies, and monitoring and evaluation of system performance. The commitment of operators in the region to support the achievement of the operations objectives is vital. The operations objectives not only reside in the metropolitan transportation plan, but also must be incorporated into the priorities of the operating agencies in the region. Decisionmakers within operating agencies in the region must be involved in the development of the operations objectives. A metropolitan transportation plan that illustrates the inclusion of specific, measurable, and agreed-upon operations objectives and shows the ties of these objectives to resource allocations in the document. A closer tie between specific, desired outcomes and resource allocation. Increased accountability and communication with the public and stakeholders through performance measurement. Engagement of the operations community, as well as law enforcement, freight, and the private sector, in setting objectives and measuring performance. A focus on both short-range and long-range needs related to the operation of the transportation system in the MTP. The MTP resulting from this approach contains specific, measurable operations objectives, performance measures, and M&O strategies that directly influence the projects selected for the transportation improvement program (TIP). This approach not only helps fulfill Federal planning requirements, but also results in an MTP that is a better able to meet customer needs, creating a more optimal mix of transportation investments. 1 U.S. Department of Transportation, FHWA, "Focus on Congestion Relief: Traffic Congestion Factoids." Available at: https://www.fhwa.dot.gov/congestion/factoids.htm, last accessed July 16, 2009.